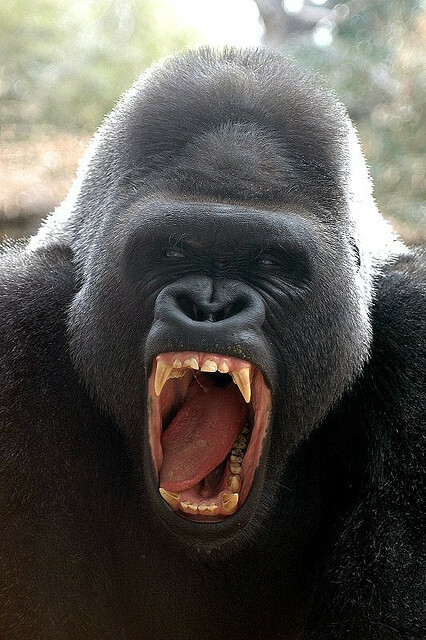 Among small lodging properties it has been common to refer to TripAdvisor (“TA”) as “the 600 pound gorilla.” While this term recognizes the enormous influence of the review site with prospective guests, it is not usually intended as a compliment. Instead it is meant critically, implying some measure of unfair treatment by TripAdvisor (B&B’s have historically been difficult to find on the site) and sometimes by reviewers (differences of opinion, sometimes remarkably so, can be readily seen by scanning the reviews of many properties). As a result of the distaste innkeepers have for the negative side of this, many refuse to pay for TA’s Business Listings, or participate in its booking program, TripConnect. But is distaste for the site a good business reason not to work with TripAdvisor? Certainly without data to back it up, any answer is inadequate. While a few years ago we were very critical of TripAdvisor’s own business practices toward its paying customers (lodging properties), TA has made many changes since then. It has a dedicated fraud unit to enforce anti-fraud policies, and has significantly increased its support capabilities for paid properties. While undoubtedly far from perfect, the improvements are significant. 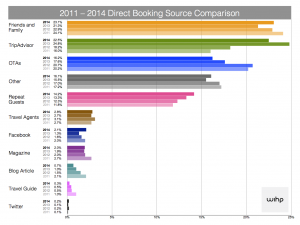 The chart at right is WIHP’s 2014 study of booking sources (these are direct bookings to the propetry website, so where bookings mention OTA’s — online travel agencies, such as Expedia, Booking.com, etc. – this is only an indication that the guest found the property on the OTA, not that they booked through them). For 2013 this study showed TripAdvisor (in green) to be the number one source of bookings. For all other years it has been in second place, behind only family and friends. That information, alone, should be enough to convince a business-minded innkeeper that maximizing effectiveness on TA is a good business decision. Your property is on TA whether you want it to be there or not. Reviews are not within your control (though responses to the reviews, are within your control, and you should be taking advantage of this great opportunity). Having your contact info and a link to your website, the ability to offer specials that pop up for viewers, and statistics on your reviews, rank, and placement, all come with a Business Listing. While not inexpensive, the value of a Business Listing should be based on its Return on Investment (ROI), not on whether or not you like the actions of the directory (unless you are engaging in a form of social protest). However, only a few of the booking engines generally used by B&B’s support Ecommerce tracking. This is appalling! About five years ago booking engines were saying that Ecommerce tracking was “coming soon.” For most of them, it still isn’t here. If you have a booking engine that does not support Ecommerce tracking, we strongly recommend that you change to one that does support it. The most effective way to determine the value of the Business Listing is to try it and measure the results. The results can be measured most accurately by using Google Analytics’ Ecommerce Tracking. Discussed in more detail here, Ecommerce tracking will show all bookings by source, and the correct value of the bookings. You can then compare the income derived against the cost to determine ROI. When we used this method at the B&B we previously owned, we found the Business Listing paid for itself many times over. Many reviewers post because they are saying ‘thank you’ to the community whose reviews helped them find a place they enjoyed. TA now hosts one of the largest user-generated collections of travel photos anywhere. For every percentage point a property improves its online reputation, its “RevPAR” (revenue per available room) goes up by 1.4 percent. For every point its reputation improves on a five-point scale, a hotel can raise prices by 11 percent without seeing bookings fall off. When properties react to reviews, both by responding to the reviews and by acting on things that caused negative comments, the ratings for the property improved. Properties who respond frequently to comments – especially with a plan for fixing negatives – are 20% more likely to get booking inquiries. Did you hear that? Responding to reviews (especially negative reviews) in a meaningful way increases the interest of prospective guests! And while none of these items specifically deals with Business Listings (so you can take advantage of them, even if you are not willing to pay for the Business Listing), there is a further takeaway here: If you do not have a business listing, the prospective guest must jump a hurdle to find you. They have to paste (or type) your property into a search engine to try to find you to see what your rooms are like and perhaps your real rates and availability. Business Listing properties have the edge! The user need only click on the link under your name to go to your website and see what is available. So, you do, indeed, ignore the gorilla at your own risk. TripAdvisor is an enormous source of business, whether you are tracking the sources properly or not. Why not make it as easy as possible for the guest to get to your website and book? Oh, and by the way, do not overlook the other takeaways listed above – there are lots of things there that will enhance your rating on TA, and that should, in itself, yield more business.